Do Well-Reviewed Movies Do Better at the Box Office? Have you ever wondered what type of relationship there might be between how movie critics rate movies and how much money movies gross at the box office? It’s an interesting thought, especially since critics’ reviews don’t necessarily reflect the same sentiments as the general public. Brendan Bettinger is a part-time writer for Collider.com, a Web site that provides the latest news in the film industry. He writes a feature for Collider called Cinemath, which combines his interest in both movies and statistical analysis. 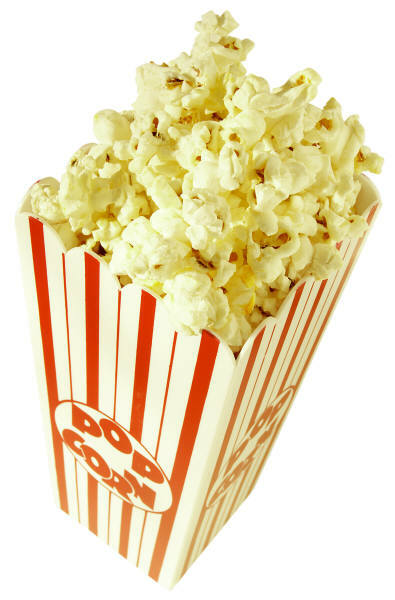 He tackles this classic divide between movie critics and audiences in his latest article, and uses Minitab Statistical Software to analyze his data. By day, Bettinger is a graduate research assistant in healthcare systems engineering at Northeastern University, a job that requires him to do a lot of statistical testing with Minitab. And while his use of Minitab during the day is more conventional, he also found a way to incorporate statistics into his writing gig. “The Cinemath articles are a fun way to translate my background in math and statistics to my night job, writing for Collider,” he says. Bettinger likes using Minitab in his articles because it’s easy for his audience to follow. “Minitab has a user-friendly interface and cleaner display output that I think suits this article, where the general audience has no background in stats,” he says. Read on to see how Bettinger uses data analysis to figure out if good movies do better at the box office, statistically. Using 2011 box office data and critic reviews on Rotten Tomatoes, Bettinger started by graphing the data with a scatterplot. The scatterplot revealed a positive slope of about 0.68, showing a positive correlation between reviews and financial success. In all, it appears that critics tend to enjoy the same movies the general public enjoys. Although the scatterplot revealed some information, Bettinger wanted to incorporate other factors (budget, rating, etc.) into his analysis to better predict box office gross. 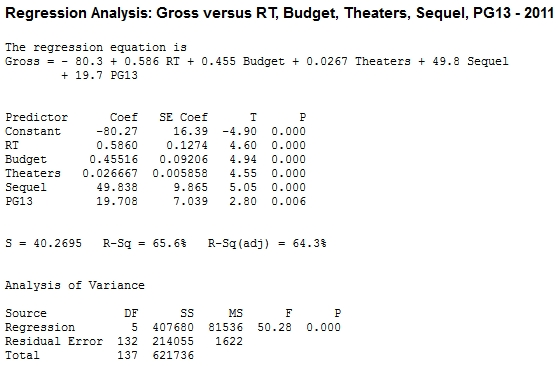 Using Minitab’s regression analysis, Bettinger tested numerous factors to identify which are statistically significant and thus good predictors of movie success. 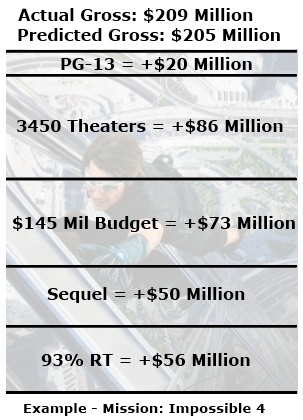 He ended up with five significant factors—Rotten Tomatoes score, budget (not including marketing budget), theater count at widest release, whether or not the movie was a sequel (where 1=sequel), and whether or not the movie was rated PG-13 (where 1=PG-13, the optimal rating for demographic variety). Bettinger also evaluated other factors, such as whether or not the movie was animated and month of release, but those factors didn’t contribute to the best model. The analysis was based on 138 movies that were screened in at least 600 theaters in 2011. All coefficients are positive, which indicates that as Rotten Tomatoes score, budget and theater count increase, so does the gross. And PG-13 movies and sequels generate more money than their counterparts. Bettinger’s R-squared value was 65.6%, so he considered his model a good fit. In fact, he was surprised he was able to get an R-squared value as high as he did with only five variables, especially considering the limitations he had in collecting accurate values for movie budgets. Bettinger is careful to say that his regression model is not the “gospel,” but he says that it gives people a general idea of what factors matter at the box office.